Based in Kent and founded 3 years ago as a Community Interest Company, Trinity Fencing CIC are fencing and landscaping experts with a significant history of investing in the community. In 2015, Founder and Director Simon Gadd developed a 3-year apprenticeship primarily for ex-offenders, but also to help prevent 18-25 year olds from actually committing crime. His research and first hand knowledge of the need for this apprenticeship came about whilst volunteering at the church prison ministry at Rochester Prison. This 3 year rolling project involves each apprentice enrolling in one of four areas of trade and carrying out commercial contracts under the mentorship Simon and the Trinity Fencing team with the pastoral support of Net Church. “We promise to qualify them, mentor them, equip them academically and vocationally, so that at the end of that 3 year period when we want to put them out as a supervisor, we'll release them from the flat, and we'll put them into a house. And the new person that will become the new apprentice, will then move into the flat. And the positive cycle continues." - Founder and Director, Simon Gadd. By the end of the apprenticeship the participants will be equipped with approximately 20 professional certificates, 2 licenses and 2 qualifications in Maths and English through the FaCT accreditation (Fencing and Construction Training). They also have the opportunity to undergo mentoring training at the nearby Christ Church Canterbury College and become supervisors to train and mentor other new trainees. The importance of secure accommodation (as well as stable employment) for prisoners to go to upon release is widely recognised as key to reducing re-offending. Trinity Fencing has recognised this and therefore also supplies apprentices with accommodation and assists with rent payments as well as working with homeless charity such asPathways to Independence and Green Pastures to provide a stable home environment while they undergo training. This is an important characteristic of the Trinity Fencing scheme since it treats employment and accommodation as two fundamental pillars to building a successful life after release. Through the apprenticeship scheme, participants are able to tackle these two hurdles whilst receiving the benefits of training, mentoring and external professional counselling. Although trainees are still within the apprenticeship and yet to finish, one volunteer apprentice, Glenn, has already completed training. It is hoped that the trainees will stay on to be promoted to Supervisor and will help train and mentor new trainees. There is also the potential to progress to Manager status and lead teams themselves as the company grows. “I've got a trade now and I can go anywhere and say that 'I can do Fencing' and I have the tickets and qualifications to prove it! I now have A-level equivalent Maths and English! What's next for me? Full-time employment and Simon is helping me get a foot in the door." 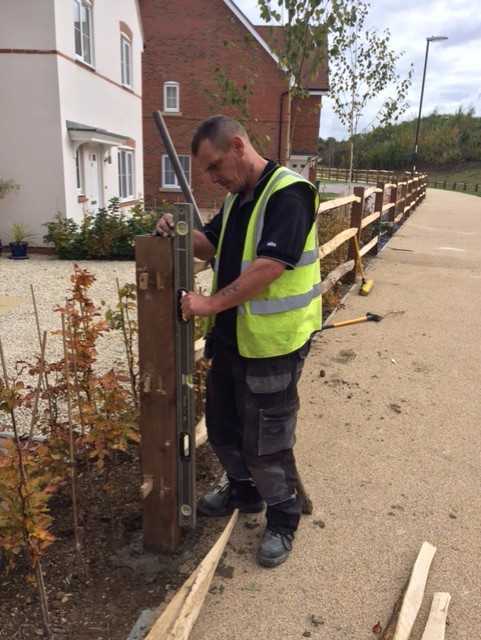 - Glenn, Trinity Fencing volunteer who has completed all his training and has passed his accredited exams, tests and assessments and is now venturing out on his own as a qualified Fence Erector.